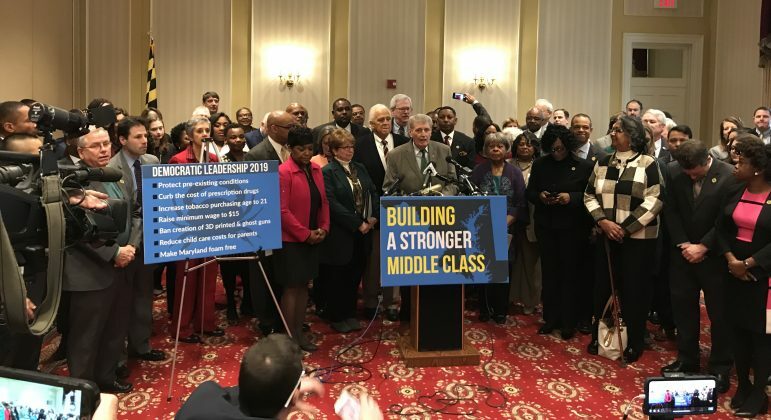 DEMS UNVEIL LEGISLATIVE PRIORITIES: Maryland’s Democratic lawmakers unveiled their to-do list for the 2019 General Assembly session on Tuesday, including a pledge to ban the use of plastic foam, raising the minimum wage and cutting prescription drug costs, Pamela Wood reports in the Sun. “It’s about helping average working people,” Sen. James C. Rosapepe (D-Prince George’s) said Tuesday during a joint news conference announcing the Democratic agenda. The set of seven policy priorities also includes increasing the tobacco purchasing age to 21 and preserving provisions on pre­existing conditions in state health plans, Arelis Hernandez reports for the Post. While lawmakers in the House and Senate say they agree on the proposals’ broad strokes — most notably increasing the minimum wage to $15 an hour — they acknowledge there is not yet a consensus on the final versions of the bills they believe they will ultimately pass, writes Bryan Sears for the Daily Record. All three of these measures fell short in last year’s General Assembly session. The fact that they’re now leadership-approved measures reflects the leftward drift of the Democratic caucuses in both changes of the legislature, Danielle Gaines reports for Maryland Matters. The End of Life Option Act would provide adults with less than six months to live the ability to get a prescription for medication that lets them die peacefully in their sleep if they decide their suffering is too great, Tim Curtis of the Daily Record reports. The act will be considered in a General Assembly with newly configured judiciary and health committees and in a year where a wave of new, progressive lawmakers have taken office. The 2019 bill is said to have support from 48 House cosponsors and 15 in the Senate. PREVIEW OF HOGAN’s STATE OF STATE: Pamela Wood of the Sun writes that Gov. Larry Hogan will deliver the first “State of the State” speech of his second term — and his fifth such speech overall — on Wednesday. She offers up a few things that you need to know. Gov. Larry Hogan has made no secret of his desire to provide a tax cut to Marylanders since first being sworn in four years ago. Bryan Sears of the Daily Record writes that the Republican, now in his second term, could be on the verge of announcing just such a proposal Wednesday during his fifth State of the State address. In a commentary for his Political Maryland blog, Barry Rascovar writes that Gov. Larry Hogan says he’ll propose a “major tax cut” when he delivers his fifth State of the State Address in Annapolis on Wednesday. Guess he isn’t expecting a recession or worrying about Maryland’s projected $5 billion structural budget deficit over the next five years. HIGHEST EARNING LOBBYISTS: For the fourth year in a row, Tim Perry and his lobbying firm remain the highest paid lobbyists in Annapolis, according to annual reports from the State Ethics Commission. Len Lazarick of MarylandReporter writes that Perry earned almost $2.4 million and the partners at Perry White Ross & Jacobson took in twice that amount, $4.8 million. Based on calculations by MarylandReporter.com, companies, trade groups and organizations spent $44 million on 153 lobbyists — counting only those making $50,000 or more as reported to the state, a few more than last year. CYBERBULLYING BILL CONCERNS FREE-SPEECH ADVOCATE: Legislation to expand Maryland’s law against cyberbullying of youngsters drew criticism Tuesday from a free-speech advocate, who was in the unwelcome position of testifying after parents whose teenage daughter was driven to suicide by online harassment, Steve Lash reports for the Daily Record. STATE AGENCY SETTLES EEOC SUIT: The Maryland Insurance Administration has agreed to settle a lawsuit filed by the U.S. Equal Employment Opportunity Commission that accused the agency of paying three female fraud investigators less than their male counterparts for the same work, Ovetta Wiggins of the Post reports. The disparity violated the federal Equal Pay Act, the lawsuit said. HOGAN PREZ WATCH: Ovetta Wiggins of the Post gives an overview of Gov. Larry Hogan as he is being courted to possibly run against President Trump in the Republican primary. Hogan is one of the most popular governors in the country.